You might just say that Susan Brownlee is the life of the party. In fact, she is the party. Since June 2017, Susan has served as Events Coordinator for Mungo Homes, a new position that has brought new excitement to Mungo communities. Susan has tried her hand at everything from pool parties to poker nights, and everything in between. She has made her mark on the neighborhoods she serves by helping build a sense of community and pride, forging friendships at every stop. What makes your position so unique within the housing market? I think that it is becoming more common to see communities hold neighborhood events, but more often than not, homeowners must wait until an actual social committee is formed. That can take some time, and even if it does happen, the events are not as organized and frequent. More than liking a house and location, buyers want to feel like they are a part of something and want a community feel. My role as Events Coordinator allows me to create social experiences for the homeowners, while building relationships within the community. I think that can make a huge difference when someone is looking for a home. What types of events have you planned for Mungo neighborhoods? Back to School Bash/Pool Parties- This particular party included a food truck, live music, a snow cone truck, etc. We had a great turnout, and surprising, even homeowners without children attended. This type of event is always popular. Halloween Pizza Party- Homeowners brought their children dressed in costumes and they had pizza before hitting the street to trick-or-treat. While the timeframe was short, we had a large turnout. This was the perfect opportunity for neighbors to see each other and feed the family before trick-or-treating. Clemson/Carolina Showdown- Homeowners dressed in their team gear and enjoyed watching the football game with their neighbors. Everyone brought a dish and enjoyed the rivalry. It was kid friendly and children played their own touch football game outside. Cookies with Santa- So much better than waiting at the mall for a photo! 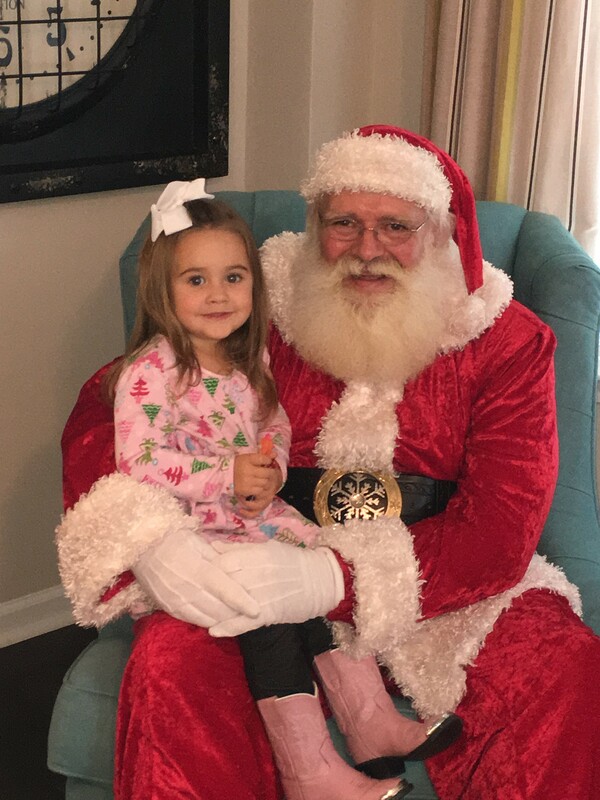 Children had the opportunity to sit on Santa’s lap and share their wish lists while parents snapped great photos. So many of our events are geared towards families and children, but occasionally parents just want some adult time. Ugly Christmas Sweater Party – What better combination than delicious food, lively libations, holiday music, and ugly sweaters?The evening provided the perfect backdrop for mixing and mingling with neighbors old and new! Poker & Bunco Night- Men and women get together for a game (or a few) of poker and bunco, complete with food, beverages, and great company. These parties have been so successful, while helping build a sense of community, that even more events are in the offing. A sneak preview of things to come as the first stirrings of spring approach: Easter Egg Hunt, Kentucky Derby Party for adults, Shagging on the Shore (lakeside, no less), Wine Tastings, Cooking Classes, and a Princess Tea. What has been your most successful event thus far? I honestly could not pick one. Each one has been fun and unique, and participation has been incredible. Have you found these events help build community within Mungo neighborhoods? I was hired last June as the first Events Coordinator for Mungo Homes. The idea to have a cruise director of sorts to plan and facilitate events for Mungo communities had been discussed for a while. What better way for homeowners to get to know each other better? In the short time I have been in this position, I have seen a difference. Homeowners who had previously known only a few neighbors, attend subsequent events and have now formed friendships with people they only knew in passing before. Some have resulted in dinner parties and even date nights. The feedback I receive is so positive. It’s been very gratifying on many levels. How will having an Events Coordinator making living in a Mungo neighborhood more attractive to potential buyers? Who doesn’t love a great party? I think most buyers are looking for the same thing. They want a home they love, in a great location, and to feel safe and secure. For the most part, people want neighbors they consider friends. Having an Events Coordinator provides residents opportunities to meet and building these relationships. I want people to tell their friends how much fun they had at the neighborhood Oyster Roast, or how much they are looking forward to this month’s cooking class. I want people to know that these communities are fun places to live.